First, Chinese emphasized biological continuance through descendants to whom they gave the gift of life and for whom they sacrificed many of life's material pleasures. Moreover, personal sacrifice was not rooted in a belief in asceticism per se but in a belief that sacrificing for one's offspring would engender in them obligations toward elders and ancestors. As stated in the ancient text, Scripture of Filiality (Warring States Period, 453-221 B.C.E. ), these included obligations to care for one's body as a gift from one's parents and to succeed in life so as to glorify the family ancestors. Thus, one lived beyond the grave above all through the health and success of one's children, grandchildren, and great-grandchildren. Finally, there was a stress on mutual obligations between the living and the dead; in other words, an emphasis on the same principle of reciprocity that governed relations among the living members of a Chinese community. It was assumed that the dead could influence the quality of life for those still in this world—either for good or for ill. On the one hand, proper burial, careful observance of mourning practices, and ongoing offerings of food and gifts for ancestors assured their continued aid. On the other hand, failure to observe ritual obligations might bring on the wrath of one's ancestors, resulting in family disharmony, economic ruin, or sickness. Ancestral souls for whom no one cared would become "hungry ghosts" ( egui ), which might attack anyone in the community. Royal ancestors, whose worship was the special responsibility of the reigning emperor, could aid or harm people throughout the empire, depending on whether or not the emperor upheld ritual obligations to his ancestors. There is evidence from as early as the Shang period (c. 1500–1050 B.C.E. ) that Chinese cared for ancestors as well as feared them. This may well have been the main factor in the development of beliefs in dual and multiple souls. Late in the Zhou dynasty (1050–256 B.C.E. ), cosmological thought was dominated by the yin-yang dichotomy, according to which all aspects of existence were a result of alternation and interplay between passive (yin) and active (yang) forces. Philosophers applied the dichotomy to soul theory. Lacking any absolute distinction between physical and spiritual, they considered the yin soul ( po ) as more material, and the yang soul ( hun ) as more ethereal. In practice, the po was linked to the body and the grave. The less fearsome hun was linked to the ancestral tablet kept in the family home and the one installed in an ancestral hall (if the family's clan could afford to build one). For some, this meant there were two hun, just as, for others, there might be multiple po. One common view included the idea of three hun and seven po. These multiple soul theories were among the factors in popular religion that mitigated widespread acceptance of belief in salvation of the individual soul. At the same time, however, multiple soul theories helped Chinese to manage contrasting perceptions of ancestral souls (as benevolent or malevolent, for example) and to provide an explanatory framework for the differing rituals of the domestic, gravesite, and clan hall cults for ancestors. While the intent of all these rites was clear—to comfort ancestors rather than to suffer their wrath—the nature of ancestral existence was relatively undefined. Generally speaking, the world of the ancestors was conceived as a murky, dark realm, a "yin" space ( yinjian ). While not clear on the exact details, Chinese considered the world of departed spirits similar to the world of the living in key ways. They believed residents of the other realm need money and sustenance, must deal with bureaucrats, and should work (with the help of the living) to improve their fate. After the arrival of Buddhism in the early centuries of the common era, it contributed more specific ideas about the realm of the dead as well as more exact conceptions of the relationship between one's deeds while alive and one's fate afterward. Over the course of Chinese history, classical texts on ritual and commentaries on them had increasing influence on the practice of rites for the dead. The text Records of Rituals ( Liji ), after being designated one of Confucianism's "Five Scriptures" during the Han era (206 B.C.E. –220 C.E. ), became the most influential book in this regard. The Family Rituals according to Master Zhu ( Zhuzi jiali ), by the leading thinker of later Confucianism (Zhu Xi, 1130–1200 C.E. ), became the most influential commentary. The influence of these texts resulted in widespread standardization of funeral rites in particular and rites for the dead in general. 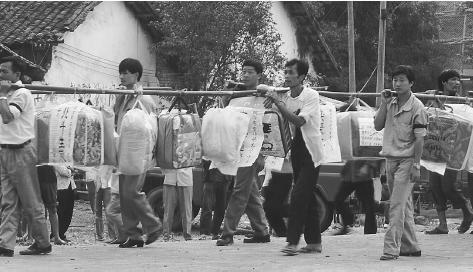 According to the cultural anthropologist James Watson, standardized funeral rites became a marker of "Chineseness" for Han (ethnically Chinese) people in their interactions with other ethnic groups as they spread into new territories. The procession to the gravesite of this funeral in China signifies a completion of the funeral rites . grave. Among these observances were very complex mourning customs. They were governed by the general principle that the closeness of one's relationship to the deceased determined the degree of mourning one must observe (symbolized by the coarseness of one's clothes and the length of the mourning period, for example). In addition to observing mourning customs, relatives of the deceased were obliged to care for his or her soul(s) at the home altar and at the clan ancestral hall, if one existed. At the home altar the family remembered a recently deceased relative through highly personalized offerings of favorite foods and other items. They remembered more distant relatives as a group in generic ancestral rites, such as those which occurred prior to family feasts at the New Year, mid-Autumn, and other festivals. Indeed, one of the most significant symbolic reminders that ancestors were still part of the family was their inclusion as honored guests at holiday meals. Lay Buddhists have been interested to an even greater extent than their monastic counterparts in the goal of rebirth in the Western paradise, or "Pure Land" ( jingtu ), of Amitabha Buddha. Unlike the ordinary realm of ancestors, which mirrors this world in most ways, the Pure Land is desired for ways in which it differs from this world. It is inhabited not by relatives, but by wise and compassionate teachers of the Buddhist Dharma, and it is free of the impurities and sufferings of the mortal realm. For some it is not a place at all, only a symbol of the peace of nirvana (enlightened state beyond cyclical existence). Legge, James, trans. The Hsiao Ching. ( Scripture of Filiality ) 1899. Reprint, New York: Dover Publications, 1963. How do they mourn? Is there any specific details? i.e. do they cry? for how long? is there any other gatherings? Do they talk about the deceased? Is it a private event? Thank you for such an interesting, well-researched and clearly written overview of Chinese Death Beliefs. I was wondering if you could supply a little more information regarding cremation in China. Are ashes kept in the home, shrine, or are they buried? To learn more about cultural ghost beliefs, you should read the e-book "Love of the Dead", a true story about young exorcist. He recounted the process using his magic to fight and neutralize the guilty souls, to help them have a optimistic view of the afterlife to integrate and regeneration... The book can be downloaded The book can be downloaded at "Smashwords". It didn't answer my question, What are the rituals Confucianism regards before death? What is the relation between confucianism and buddism?